environmentalists are concerned over a recent deal between China and Indonesia to set up a palm plantation project on the island of Borneo. It is feared the project may destroy some of the untouched portions of tropical forests of Indonesia. Often called the lungs of Southeast Asia, these forests are also home to dozens of new species found in recent years. As per the agreement, over the next decade, China will invest around us $30 billion in the project spread over 1.8 million hectares. It will supposedly be the world's largest palmoil project. The deal is seen as a fresh infusion of capital into the region after investment by us companies declined. Experts say the project will benefit China in two ways: one, cutting down trees from the tropical forests will help it tide over its timber scarcity, and two, it will receive palm oil at a cheaper price for use in its industries manufacturing detergents, soaps, lipsticks and chocolates. 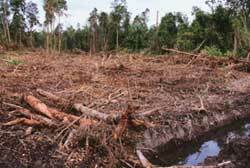 Environmentalists, however, warn against the project as Southeast Asia is already facing large-scale deforestation. "Such plans could have a devastating impact on forests, wildlife and indigenous people of Borneo," says the World Wildlife Fund (wwf) in a press release. At least 360 species have been discovered here between 1994 and 2004. Palm oil is a popular cash crop in Southeast Asia, particularly due to its huge export potential. A significant tract of natural forest has already been converted to palm tree plantation in regions like Borneo.